Pumpkin is a super food that can be used to make savoury or sweet dishes. You might like to surf and find some yummy pumpkin recipes on this blog. Here come my favourite pumpkin scones for breakfast. Scones, basically simple biscuits, served with cream and quality berry jam, are well-known as Devonshire Tea. Many different versions are enjoyed around the world though. Scones are easy to be whipped up in a short time. I love to make more and reserve some for early mornings. Just lightly reheat them and they will taste as nice as those fresh from oven. 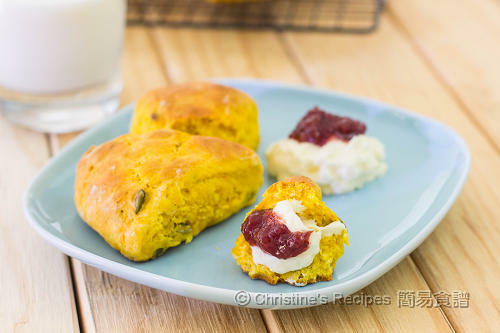 The sweet pumpkin puree and pepitas make these scones taste even more delicious and contain more nutrients. Nothing can beat these scones enjoyed with a cup of tea or coffee. Heat pepitas in a small pan without any oil over medium heat until aromatic. Remove from heat and let cool completely. Sift the flours, baking powder, sugar, ground cinnamon, ground nutmeg and salt together and combine well. Transfer to a food process and add the butter. Pulse about 15 times, just to combine. Transfer into a large mixing bowl. Add whisked egg and reserve 2 to 3 teaspoons to adjust the dough consistency. Use a spatula to lightly combine all ingredients. 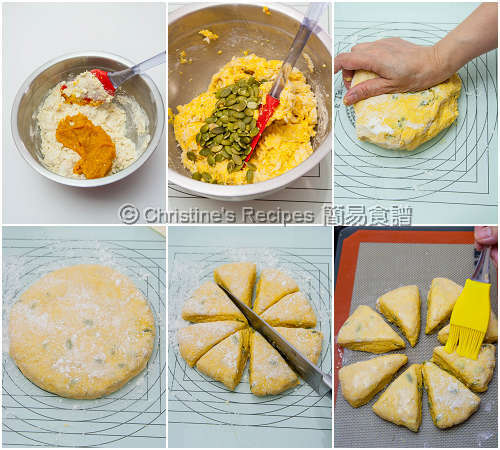 Fold in the pumpkin puree and pepitas. If the dough is too dry, gradually stir in some milk. If it’s too wet, sprinkle some plain flour. The basic idea is to get a non-stick dough surface. Transfer to a floured surface. Knead the dough a few times. Be sure not to over knead it. Otherwise gluten is generated and the scones will turn hard. Roll out into a disc about 2cm in thickness. Cut into 8 equal portions. Carefully transfer onto a lined baking tray. Lightly brush the surface with milk and egg mixture. Bake in the preheated oven for about 15 to 20 minutes. Remove from oven and let them cool on a wire rack. Serve warm with cream and favourite jam. 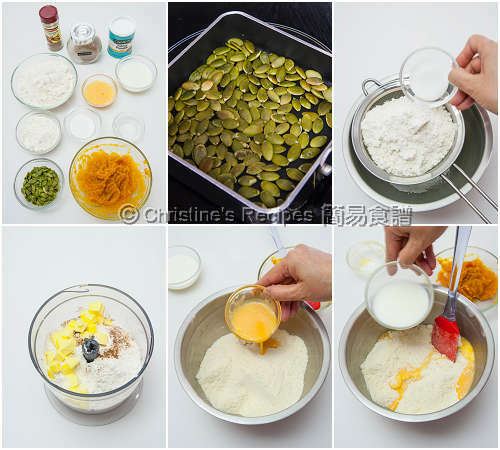 To make pumpkin puree: Peel, deseed and cut the pumpkin into small chunks. Cook in a microwave oven or steam in a wok. Press with a knife or process in a food processor to a paste. If you adapt the method of steaming, cover the pumpkin in order to avoid any water drips from making the puree too wet. As the water content in pumpkin varies, it’s better to reserve some milk to adjust the dough consistency. The secret to make light and fluffy scones: don’t ever over knead the dough. Move quickly and just combine the ingredients. Did you use kabocha pumpkin for this? I used the local produce, called Kent pumpkin. 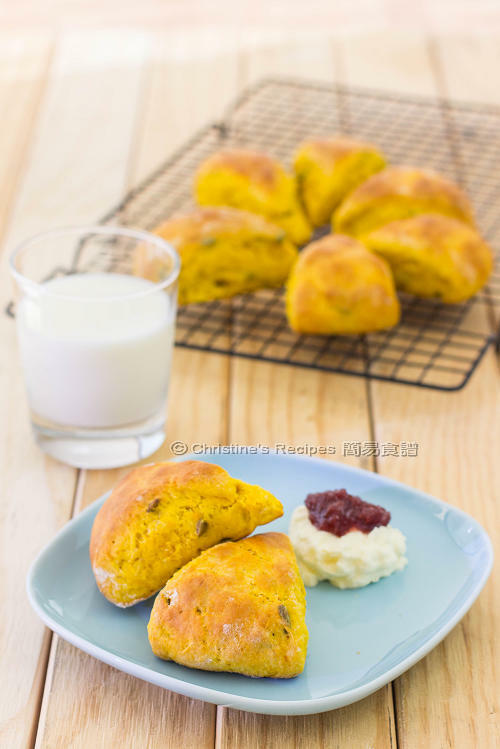 I have been thinking to bake some pumpkin scones for the afternoon tea. This recipe seems easy and delicious! Glad that you kids loved these scones. Very clever tweak of making your own breakfast.